Do you suspect your hard-to-reach structure is corroding or deteriorating? Talk to us and find out how our technology can help. From buildings, bridges, rails, tanks, tunnels, roads viaducts reinforced concrete, steel and composites, no structure is hard to access. 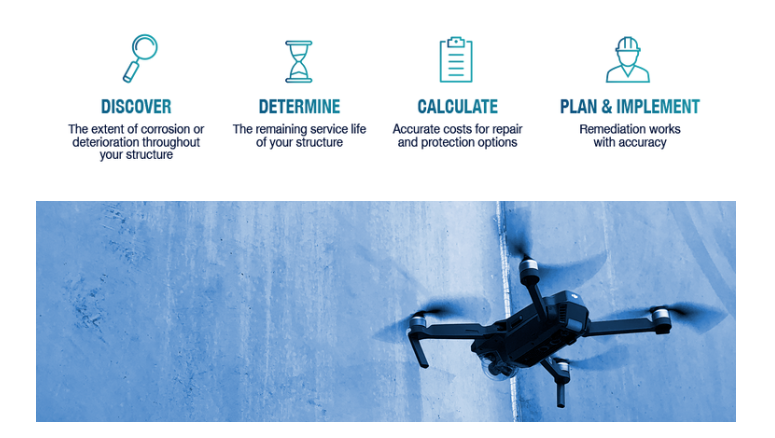 Ask us how Infracorr’s technology can enhance the service life of your assets and infrastructure. Drones and Remotely Operated Vehicles (ROVs) present an accelerated option for initial investigation in the shortest timeframe and with minimal equipment set-up required. Where time is at a premium and access is difficult, you can benefit from having fewer personnel on field, faster deployment and collation of data working with Infracorr. This suits structures such as high-rise buildings, roofs, rail bridges as well as tanks, silos and gas installations. Above the water line, deterioration is often readily apparent with remedial measures being taken. However, when a structure is partially or totally submerged, damage might not be detected until the deterioration has reached an advanced state of distress. Underwater inspection can help you save significant costs of failure. This suits wharfs, jetties and partially or fully submerged structures in marine or other aggressive environments.